Converting Compliance Challenges into Business Benefits " "
The WealthBriefing group of newswires prides itself on being at the forefront of the wealth management industry’s evolution, both observing and helping to drive its development through the publication of news, analysis and guides, research, training and events, and comprehensive awards programmes covering the world’s most prestigious jurisdictions. Synthesising the views of all market participants - institutions, their providers and increasingly clients too, is the foundation of what we do. It is therefore particularly exciting when we are tasked with exploring a topic that remains largely untouched by research, or that has not been explored in the depth or international breadth it now warrants. The subject of client onboarding processes is not only highly topical, as several big name were known to be making massive investments in new systems, it also represents the crux of many of the challenges - and opportunities - facing private banks and wealth managers, of all shapes and sizes, all over the world. This report is optimistic about wealth managers’ ability to turn client onboarding and reviews from a bureaucratic hurdle into a gateway to better client servicing and advice. It also explores the ways that compliance activities can be retooled to ramp up revenues, rather than being a cost centre which just grows and grows at a time when margins continue to be under pressure. To paraphrase the title of this report, additional regulation may be a fact of life for wealth managers today, but there is a lot that they can do to convert compliance challenges into business benefits. The survey and interviews on which this report is based suggest that many wealth managers are really struggling to onboard their clients as quickly and cost-effectively as they would wish. The client experience during onboarding can often be marred to the point of clients walking away as a result of inefficiencies, mistakes or delays. Meanwhile, no one in the financial services industry could have missed the avalanche of new regulations – and fines for breaches – that have hit wealth managers in recent years. The penalties for poor performance in onboarding and reviews can be numerous and severe. Technology investment isn’t a panacea, although it is arguable that in the instance of improving client onboarding it comes close – simply because the process lends itself to automation, systematisation and innovation so well. Similarly, just as improving onboarding hasn’t been a huge focus for the sector historically, it now seems to be a route to achieving several key objectives across the business. As this report will hopefully show, more holistic advice, robust risk management, cost-control and a better client (and advisor) experience are all “boxes” that enhanced onboarding can help firms tick. 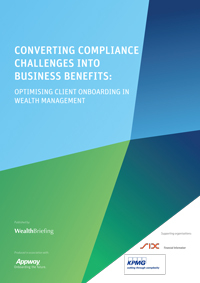 On 24 October 2014, leading industry experts met at Vestra Wealth's offices in the City of London to discuss the findings of this exciting new research report and to discuss the many challenges onboarding has for both the advisor and the client. Please click here to download the research report.